The Mountainwood condos for sale are in one large building of four-stories, located just across a footbridge from the base of Peak 9 of the Breckenridge Ski Resort. 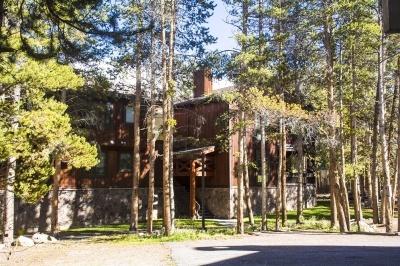 All Mountainwood Condos have balconies and great views of the Breckenridge Ski Resort or the surrounding mountains. There is plenty of surface parking, surrounded by tall pine trees. The Columbine pool is at the center of the loop, southwest from Mountainwood Condos and is a nice forested oasis, with heated pool, several hot tubs and a common area, available for use by homeowners and guests of the small group of condos in this area. 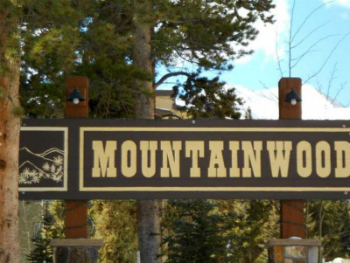 Discover more about owning a condominium in Breckenridge, or start your search with the available Mountainwood condominium listings below. Located on the inside of the Columbine loop, at about 11 o’clock (where noon is north) the walking path to Main Street Station is just across the road. From there downtown Breckenridge continues for another six blocks, so everything the resort has to offer is easily accessible. So too, is the start of a good hike into the national forest. The Burro Trailhead is a few hundred yards up the ski slope. The Columbine area was developed in the early nineteen-seventies to offer lodging near what was then the new base area on Peak 9, and includes several buildings similar in height and scale. Of these, Mountainwood is the newest built in 1979. Driving to the Columbine area changed in 2000, when Main Street Station was built. Previously, cars had to negotiate through the Bell Tower Mall, but Columbine Road has since been reconfigured and is now accessed from Broken Lance Drive. The reconfigure eliminated drive-through traffic to these condos and made walking more pleasant, but didn’t change how close Motherlode Condos are to shopping and restaurants. Size: 959 sq. ft to 1134 sq. ft. Amenities: walk to Peak 9, on bus route, walk to downtown, pool, quiet Warriors Mark neighborhood. Located at 720 Columbine, across the Blue River from the base of Peak 9, across Columbine from the Marriot. Drive south on Main Street to last stoplight at Boreas Pass Road, turn right on Broken Lance Drive. At the three-way stop, turn right onto Columbine. The road is a loop and Mountainwood will be the third complex on the inside of the loop. Would you like more information about living in Mountainwood condominiums? Contact us today or call us at (970) 453-2200 to find out how we can help.